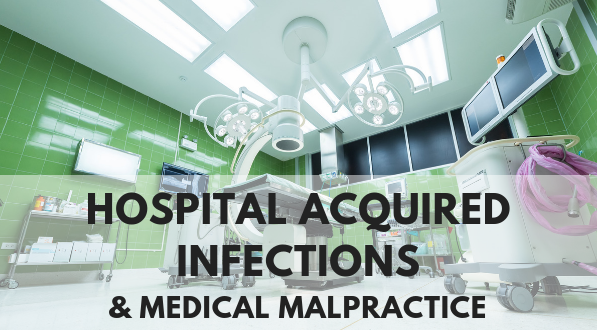 Hospital Acquired Infections & Medical Malpractice Lawsuits | Saponaro, Inc.
Studies have shown that proper patient safety interventions at hospitals can reduce the number of HAIs by as much as 70 percent. That means that many times, safety slip-ups or improper procedures cause patients to acquire dangerous infections, leading to medical malpractice lawsuits. What are the types of conditions that fall under the category of hospital acquired infections? Central line-associated blood stream infections: bacteria or viruses enter the bloodstream through a venous catheter. This occurs when the venous catheters are not inserted or maintained properly. Catheter-associated urinary tract infections: these are infections in the urinary tract system caused by a urinary catheter. They can occur when the urinary catheter is used for too long or is not maintained or inserted correctly. Methicillin-resistant Staphylococcus aureus (MRSA): these infections occur from staph bacteria and are resistant to many common types of antibiotics. They can cause skin infections, pneumonia, or other serious conditions. Clostridium difficile infections (C. diff): these are infections that cause inflammation of the colon. They are caused by touching surfaces that are contaminated by C. diff bacteria, found in feces. Surgical site infections: these are infections that occur at the incision site following a surgery. Treatment sometimes requires a second surgery. As you can see from the list of common infections above, many of these inpatient, hospital-onset infections are caused by improper maintenance or procedures. For example, a patient can contract C. diff if hospital staff’ hands are contaminated with the bacteria and he/she forgets to wash or sanitize his/her hands (proper hand hygiene) before making physical contact with a patient. When we examine hospital acquired infection data from Leapfrog Group, we see that the percentage of hospitals reporting zero infections for the above five HAIs has declined significantly since 2015. This means more patients are at risk each year for suffering from a preventable and life-threatening infection while staying in a hospital. Let us take the work of identifying an expert for your medical malpractice case out of your hands. We have thousands of experts standing by to assist you with your case. Find one today.